I would like to specifically draw your attention to the new functionality added to the SMARTCyp plug-in. 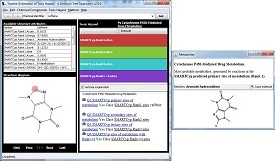 It supports now metabolite generation, based on sites of metabolism, as predicted by SMARTCyp. SMARTCyp is developed by PatrikRydberg and has been included in Toxtree since release 2.1.0. It was recently extended to provide information about the reactions (SMIRKS), associated with every predicted site of metabolism. Toxtree 2.5.0 makes use of the reaction SMIRKS and Ambit's SMIRKS engine, in order to generate the structures of the reaction products. Together with Patrik Rydberg we will be holding a Hands on exercise for metabolite predictions at the OpenTox Interaction meeting, using SMARTCyp and Toxtree 2.5.0. Another new functionality in Toxtree is the support for more identifiers in the input text box at the top of the application window. It is no more restricted only to SMILES and accepts InChI, parsed by the JNI-InChI package, chemical names lookup in Open Parser for Systematic IUPAC Names (OPSIN), as well as CAS and EINECS resolving by calls to a remote OpenTox service. Please note that the remote lookup is disabled by default -- check the "Method/Decision tree option/Remote Query" menu to enable it. You could have a look at the Toxtree web site for more information on Toxtree 2.5.0's new features and downloads.